Chinese History: A New Manual (Chinese: 中國歷史新手册; pinyin: Zhōngguó lìshǐ xīn shǒucè), written by Endymion Wilkinson, is an authoritative and often witty guide to Sinology and Chinese history for which he received the Prix Stanislas Julien for 2014. At over 1.5 million words (the equivalent of nine monographs of 400 pages apiece), the New Manual comprises fourteen parts subdivided into a total of seventy-six chapters. Books 1–9 (chapters 1-54) contain extensive introductions to the history of the following subjects: Language; People; Geography and the Environment; Governing and Educating; Ideas, Beliefs, Literature, and the Fine Arts; Agriculture, Food, and Drink; Technology and Science; Trade; and Historiography. Books 10–13 (chapters 55-68) present primary and secondary sources chronologically by period. Book 14 (chapters 69-76) covers bibliography. Each chapter introduces the published, excavated, artifactual, and archival sources from earliest times to the late twentieth century and not only examines the context in which they were produced, preserved, and received, but also suggests and comments on the best secondary scholarship in Chinese, Japanese, and Western languages. The present fourth edition (green-cover) updates, expands, and corrects the third edition. Some 9,800 primary, secondary, reference works, journals, and databases are introduced in the course of the discussion (compared to 8,800 in the third edition; 4,000 in the yellow-cover edition of 2000; and 2,900 in the blue-cover edition of 1998). In addition to the greatly extended scope of the New Manual, new features are introductions to hundreds of digital resources (including 225 of the latest databases) and a wide selection of up-to-date secondary works (including citations of over 1,500 journal articles and book chapters). Interspersed throughout are short essays introducing the ancillary disciplines required for Chinese historical studies—archeology, astronomy, chronology and calendrics, codicology, diplomatics, epigraphy, genealogy, historical geography, historical linguistics, numismatics, onomastics, paleography, prosopography, sigillography, statistics, textual criticism, topology, and special branches of study such as oracle-bone script, bamboo and silk books, Dunhuang, Qingshuijiang, and Huizhou documents or the Ming-Qing archives. Other short essays address the uses of history and how to avoid errors in thought and analysis. There are chapters on translation into and out of Chinese. Throughout the New Manual lists of basic terms give standard translations. In an interview with Carla Nappi, an historian of China at the University of British Columbia, Wilkinson discussed his experience in the field and the book's background. He became interested in China as an undergraduate at Cambridge University in the early 1960s, then spent two years teaching English in Beijing up to the outbreak of the Cultural Revolution. He earned a PhD from Princeton University with a dissertation on late Qing dynasty markets and prices, but when he began teaching he still felt unprepared. He did not know, he recalled, what to tell his graduate students about the Zhou or Shang dynasties, about which he felt his knowledge would hardly "fill an eye dropper." On a research fellowship at Harvard University, Wilkinson mentioned to John Fairbank, a senior Harvard scholar, that he was gathering notes on Chinese history. Fairbank offered to publish them, and the 1973 Research Guide appeared in due course. Wilkinson served in Beijing as the European Union Ambassador to China from 1994 to 2001, and in his spare moments worked on updating the 1973 Research Guide. After he retired as EU Ambassador, Harvard invited Wilkinson to teach Chinese history, including a graduate seminar on sinological methods. For the next fifteen years he worked on the New Manual, commuting between Harvard and Peking University (where he was a visiting professor). In this way he was able to make full use of the Harvard-Yenching Library as well as all the scholarly resources that Beijing has to offer. The first "preliminary" version, The History of Imperial China: A Research Guide (1973) was a 70,000 word introduction to Chinese primary sources and research aids mainly for students of socio-economic history. James Cole published a supplement, Updating Wilkinson (1993). Harriet Zurndorfer noted in the Introduction to her China Bibliography (1995) that her range of topics was somewhat wider than Wilkinson's "excellent manual," and that she included a history of sinological studies, but did not duplicate information in Wilkinson. The jacket of the 1998 Chinese History: A Manual was blue and designed to resemble a traditional Chinese book cover. The preface to the revised and enlarged edition, published in 2000, with a yellow cover, explains that the purposes of the manual were both technical and intellectual. The manual was not intended as a bibliography of secondary scholarship but to introduce the main primary sources and to suggest solutions to basic research problems while giving readers a sense of the "spectacular changes that took place in Chinese history." The (crimson-cover) New Manual (2012) was in effect a new work. Although adding a million words the typeface was shrunk and the page composition adjusted to keep the size to a single volume and the price affordable. The 2000 edition had established the manual as the top-selling title in the Harvard-Yenching Monograph Series. A record that the New Manual has maintained. The preliminary version of the manual (1973) was published by Harvard's East Asia Research Center. From 1998 all later editions have been published by the Harvard University Asia Center for the Harvard-Yenching Institute and distributed by Harvard University Press. Eric Croddy said of the Chinese History: A New Manual, Fourth edition (2015), "For any student of China (and at every level), Chinese History: A New Manual is not only a masterful scholarly endeavor, it is also (happily) a real page turner indeed, with captivating insights on every page. And it is very much a unique resource for further inquiry." No one seems to have measured exactly how old Chinese civilization is, but Endymion Wilkinson can probably give a more precise answer than anyone else. "1.6 billion minutes separate us from the Zhou conquest of the Shang," he informs us at the beginning of his Chinese History: A New Manual. Undaunted, he then sets out to describe just about everything that has happened since. Endymion Wilkinson has created an extremely useful navigational guide in English to the vast ocean of China's long traditional civilization. Because of its many strong points it can be considered one of a kind, a unique work that at some point every serious scholar of China whose native language is English will want to consult—though I hasten to add that its value extends to scholars of China working in other languages as well. This is the most comprehensive work of its type that has yet appeared in English. Most of the 76 chapters in the New Manual provide detailed coverage of technical sinological topics, such as "Learning the Characters Today" (#2.6), "Old Ways of Learning the Characters" (#22.1), "Translation from and into Chinese" (3# and #5), "Transcription of Chinese" (#4), "Personal Names" (#8), "Biographical Topoi (#9.9), "Counting and Recording a Person's Age" (#9.11.1 and #9.11.2), "Toponyms" (that is, placenames) (#15), "Titles of Nobility & Elite Posthumous Titles" (#19), "Strategic topography" (#24.4), "Military statistics and provisions" (#24.5 and #24.14), "Numerological mnemonics" (#38.11), "Buddhist, Muslim, Tibetan, and Other Calendars" (#39.8), "Dates and Their Conversion" (#39.12), "Telling the time" (#40.6), "Weighing & Measuring" (#42), "The Size of Chinese Book Collections" (#71.1.9), "Keeping Up-to-Date" (#76). Also included are topics of more general interest or controversy. Chapter 12, "Zhongguo, China, and the Chinese People," for instance, argues that "Zhongguo," the modern term for "China," only became generally used to name the whole country in the late Ming, early Qing. "Writers of patriotic or national history," Wilkinson warns later, "in China as elsewhere, as a matter of principle employ current toponyms to name historical places. This enhances the conviction that 'our' people and 'our' territorial borders have existed since the beginning of time in an unbroken continuity." Chapter 36, "Food and Drink" opens with "Ten Keys to Chinese Cuisine," starting with the Neolithic discovery of a mould ferment or yeast not found in Europe which was the basis of fermented pastes and sauces, including wines and vinegar. Chinese cuisine drew on a huge and expanding land area, benefited from technological change, and was enriched by dietary and medicinal emphasis on good health. Variety and complexity arose from social reasons, too, in the mingling of different faiths and social classes as well as continuous absorption of all sorts of non-Han influences. Some results are surprising, for instance, chopsticks: "The first ones used for placing food in the mouth may be the bronze pair excavated from an Anhui site dating from the late Chunqiu," yet "many centuries were to go by before they replaced the use of hands at the table (and the forefinger and index finger is still called shizhi 食指, the eating or tasting finger)." There are one hundred twenty five boxes, each with a few paragraphs on a specific topic. Box #1 – "The Manner of Speaking" – points out that historians write about people in Chinese history "as if they were producers of silent movies" because they almost never describe how a Chinese historical personage would have sounded when he or she spoke. Only the tiny minority of those who qualified to become government officials by taking exams at prefectural, provincial, or capital levels had a chance to learn guanhua (the lingua franca used by officials). But even then they would have spoken it in heavily accented dialect forms. For this reason they found it more easy to communicate in writing. In other words, "it was no accident that Chinese elite culture put such an emphasis on the written word." Wilkinson makes the additional point that because women were less mobile than men they would have spoken with much thicker dialect accents than their brothers. One series of boxes takes on the origins, history, and nature of Chinese characters. Another series gives a rundown on social history, such as coming of age and age at death. Some are specialized, such as "Duplicate Biographies in the 24 Histories" (#24) and "Left and Right in Official Titles" (#39) or "Arbitrary Tax Conversion Ratios" (#82). There are 149 tables, including periodization; branches and stages of the Chinese language; popular names in contemporary China; stages of life; historical population; Qing examination system; main genres of poetry; Five Phases Theory Correspondences; weights and measures by periods of history; tables of contents of major historical works, including standard dynastic histories and the Shiji; historical novels; book production in several historical periods; aspects of the Siku Quanshu and Gujin Tushu Jicheng, etc. Cole, James H. (1991). Updating Wilkinson: An Annotated Bibliography of Reference Works on Imperial China Published since 1973. New York: J.H. Cole. ISBN 0962912204. Davis, Chris, (2013) History manual takes scholarship to new level China Daily.com December 13, 2013. Knechtges, David R. (1979). "Book Review: The History of Imperial China: A Research Guide". Journal of the American Oriental Society. 99 (2): 330–333. doi:10.2307/602676. McDermott, Joseph (2001). "(Review)". The Journal of Asian Studies. 60 (1): 192–194. doi:10.2307/2659532. JSTOR 2659532. Sivin, Nathan (1975). "Book Review: The History of Imperial China: A Research Guide". Journal of Asian Studies. 34 (3): 821–824. doi:10.2307/2052561. Suleski, Ronald Stanley (2000). "Chinese History: A Manual (Review)". China Review International. 7 (1): 240–243. doi:10.1353/cri.2000.0051. Tao, Wang (1999). "(Review)". Journal of the Royal Asiatic Society. 9 (3): 457–458. doi:10.2307/25187914. JSTOR 25187914. Wilkinson, Endymion (2015). 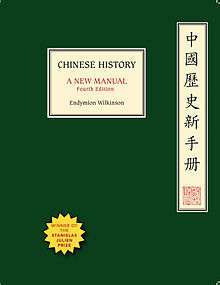 Chinese History: A New Manual, 4th edition. Cambridge, MA: Harvard University Asia Center distributed by Harvard University Press. ISBN 9780674088467. —— (2012). Chinese History: A New Manual. Cambridge, MA: Harvard University Asia Center distributed by Harvard University Press. ISBN 9780674067158. 2nd printing (revised), March 2013; 3rd printing (revised), September 2013. —— (2000). Chinese History: A Manual (Revised and Enlarged). Cambridge, MA: Harvard University Asia Center distributed by Harvard University Press. ISBN 0674002490. —— (1998). Chinese History: A New Manual. Cambridge, MA: Harvard University Asia Center distributed by Harvard University Press. ISBN 0674123786. —— (1973). The History of Imperial China; a Research Guide. Cambridge, MA: East Asian Research Center, Harvard University; distributed by Harvard University Press. ISBN 0674396804. Zurndorfer, Harriet (1995). China Bibliography: A Research Guide to Reference Works About China Past and Present. Leiden; New York: E.J. Brill. ISBN 9004102787. ↑ The Stanislas Julien prize has been awarded annually by the French Académie des Inscriptions et Belles-Lettres (founded Paris, 1663) in recognition of outstanding scholarship on Asian culture. In all 120 people and two institutions have received the prize since it was inaugurated in 1875. 1 2 Wilkinson (2015), p. xv. ↑ Wilkinson (1973), p. xi-xii. ↑ Zurndorfer (1995), p. 2. ↑ Wilkinson (2000), pp. xv–xvi. ↑ Suleski (2000), p. 240. ↑ Wilkinson (2015), p. 191-93. ↑ Wilkinson (2015), p. 214. ↑ Wilkinson (2015), pp. 441–442.